The Winter Olympics was taking place, and women’s snowboarding was about to start off on February 12th, 2018, where one of the youngest competitors for the US team was about to compete in the Women’s snowboarding half pipe. Chloe Kim was born in California in 2000, when her father took her snowboarding while she was only 4. 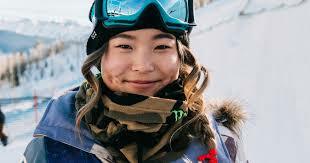 In 2014 Chloe Kim participated in the X games where at one point she was the youngest gold medalist when she was 14, until 2015 where Kelly Sildaru won gold at being only 13 years old. In 2016 she became the first ever person to ever win 2 gold medals back to back in snowboarding under the age of 16, but while in 2016 she participated in the youth winter Olympics where she became the only girl to win gold in snowboarding. After getting this achievement she was asked to be the flag bearer for the US team at the opening ceremony at the 2016 winter Olympics. Now in 2018, she competed in the 2018 Pyongchang winter Olympics where she was eligible to compete on the US team in the women’s snowboarding half pipe where she won gold on her first winter Olympics. During her first run, she landed inverted 540 and an Indy grap and finished with a 720 which landed her an 85.50. During the second run, she was the first women to ever try a back to back 1080 but sadly did not land it in her second run, but after that even with her mess up she was far ahead of the competitors which landed her a gold before the third run. Finally in the third run down, she had already scored the gold medal which could’ve given her a straight ride down, but no she had to break the wow factor and landed back to back 1080s being the first ever women to land this difficult trick landing her a score of 98.25 almost a perfect ride.